Today is publication day for the mass-market paperback of Austral, my novel about a short but somewhat troublesome walk across the fjords, forests and ice fields of the Antarctic Peninsula in the not very distant and somewhat warmer future. Please do check it out. 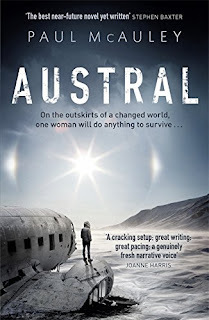 Coincidentally, I received confirmation that Big Talk Productions have taken up an option to use Austral and a couple of associated short stories as the basis for a multi-season TV programme. This is a long way from actual production, of course. And given that most options don't pan out into actual programmes, this may be as far as it goes. Still, it's a very nice boost to my morale, especially given the timing. Meanwhile, here's a short section of Antarctic history that didn't make it into the finished book, first published here in October last year.